Will My Term Life Insurance Policy Rate Match My Online Quote? Will the final price of my life insurance policy be the same as my online quote? If you have compared your quotes for term life insurance and filled out your application online, you may be wondering what the final pricing for your life insurance policy will be. In this post, we explain why your final offer from your life insurance company could be more or less than the quote you received while shopping online. The more you understand how life insurance underwriting works, the easier you can evaluate your policy options and determine the pricing that is best for you and your family. Will my term life insurance policy rate be the same as my online quote? 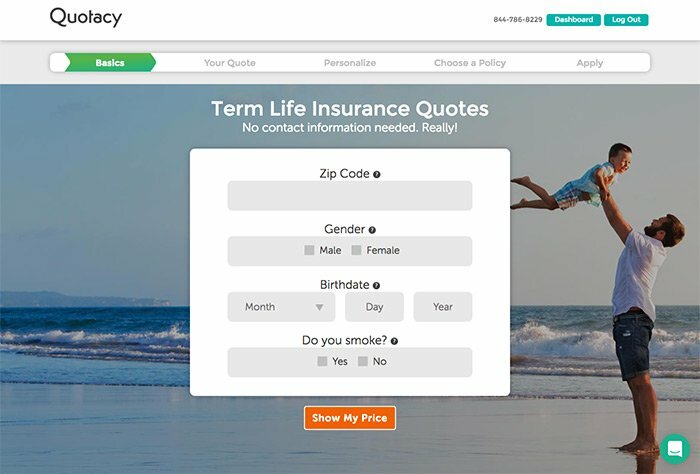 If you are using an online shopping tool (such as Quotacy’s) to compare term life insurance policy quotes side-by-side, you’ll notice that each life insurance company offers a different price for the same term length and coverage amount. In the screenshot above, you see quotes ranging from $17.43 to $18.16 per month for a $500,000, 20-year term life insurance policy. Each life insurance company has their own pricing structure. 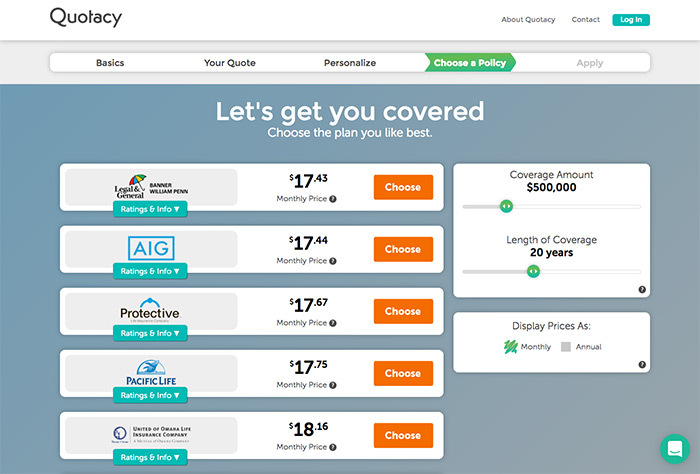 At Quotacy, we’ve made the process of comparing term life insurance quotes from dozens of trusted companies easier for you. In minutes, without entering any personal contact info, you can quickly get a ballpark estimate of how much your life insurance could cost per month based on your own preferences that you select in our quoting tool. Our ballpark quotes are fairly accurate for most individuals, but for some with more complex health conditions, risky hobbies, or a high-risk job, for example, the life insurance company may need to ask you for additional information to accurately determine your mortality risk and, therefore, your final cost for life insurance. Determining policy rates that are fair to you and that don’t represent an unacceptable risk for the life insurance company is what underwriters do. They look at the big picture of your risk factors, such as the combination of your age, gender, health, family medical history, and so on, as they evaluate your application. There are two types of underwriting processes available in today’s life insurance marketplace. Some life insurance companies offer accelerated underwriting to insure you without a medical exam. Some offer traditional underwriting that requires a physical exam to evaluate your health. If during your medical exam, there are health factors that show up that you didn’t report on your application or during your phone interview, this may cause your life insurance policy quotes to be different from those that you found online. If your blood pressure reading is high during your medical exam and you have not stated on your application that you suffer from hypertension, your life insurance company may investigate further. This may influence your life insurance policy quotes and cause them to be higher than your online quotes. If you do indeed have hypertension, but your blood pressure is under control and you have not experienced end-organ damage, then your application may be considered within a standard risk class. If, however, your blood pressure reading indicates formerly undetected hypertension, you may receive a higher rate. It’s important to fully disclose all of your medical conditions on your life insurance application. Doing this allows Quotacy’s in-house underwriters and life insurance agents to help place you with a life insurance company that works best with your health history. Our in-house underwriters can do what’s called an “underwriter’s first look” before submitting your application. The first look uses their industry experience to guide you in the right direction from the start. That’s one advantage of working with a life insurance broker like Quotacy. When preparing for your medical exam, it’s important to be aware of the impact of what you eat near the time of your exam. If you are not being treated for high cholesterol levels, then an appearance of elevated levels of low-density lipoprotein (LDL), which is an indicator of coronary artery disease or stroke risk may cause your life insurance policy quotes to be higher than your first online quotes. Eating fatty foods around the time of your exam can temporarily raise your cholesterol levels, causing you to receive a reading that presents an inaccurate portrait of your health. If you have coronary artery disease, take a look at our insurance buyer’s guide for your condition. Changes in your height and weight will influence your life insurance policy quotes. Insurance underwriters look at your Body Mass Index (BMI) differently than your doctor might. 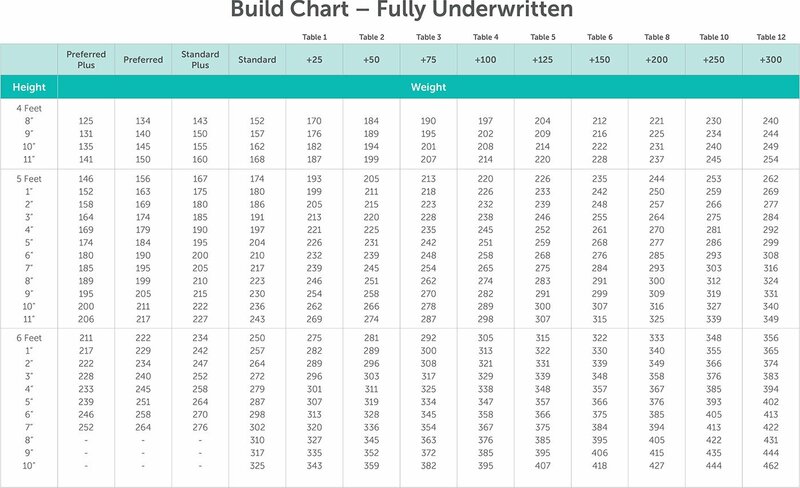 They use a special Build Chart to place you within a specific risk class. If your weight is different than what you reported when you received your initial quote, then your life insurance policy quotes may be higher or lower than the premiums that you found online. Helping you find the best life insurance company for your age, health, and lifestyle is our specialty. By doing this, there is a higher likelihood that the price you were quoted online will match the final price offered to you after your application is underwritten. If you have mental health issues this will not necessarily prevent you from becoming insured. Details of how well your issues are managed with medication or therapy (or both) will help life insurance underwriters determine a fair rate for your premiums. When you use our platform to find term life insurance, we go to bat for you to find a good fit for your application. For example, within our quoting tool, you’ll see a section called Quotacy’s Advice that shares insights into which life insurance company is best for each type of applicant. You can also review this advice from our life insurance company reviews for each company with work with at Quotacy. Your family’s medical history may impact your life insurance policy quotes. There are many companies, like Legal & General as shown in the screenshot above, who offer competitive rates for individuals who have had close relatives (father, mother, or siblings) diagnosed with or who have died from cancer. 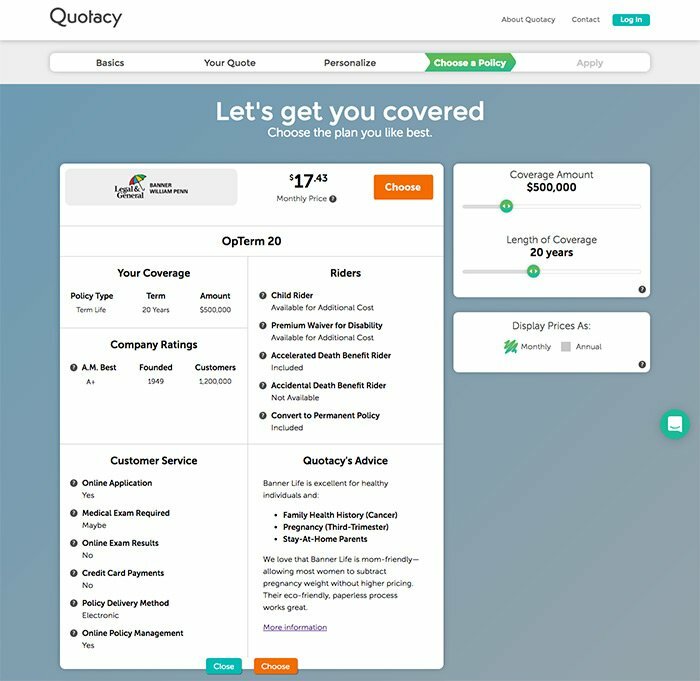 Quotacy works with numerous leading life insurance companies and will make sure that your application is matched with a company that is most likely to approve your application with the best pricing for your family medical history. Life insurance companies may define your smoking status differently. If you have recently quit smoking, your insurance company may still consider you a smoker. If you classified yourself as a non-smoker when you received your online quote and it is revealed that your last use of tobacco was too recent to allow you to maintain that status, your life insurance policy quotes will be different from the rate that you saw online. Read our life insurance buyer’s guide for smokers to learn how smokers can get affordable term life quotes. If your job entails foreign travel or requires you to occasionally perform high-risk duties, this may cause you to receive higher life insurance policy quotes than you originally received online, if you didn’t mention that hazards of your job. The same goes for hobbies that may put you in harm’s way. So what do you do if your premium is different than quoted and you aren’t happy with the result? 1. Stay with the life insurance company that you picked, but change the coverage amount or length of term to make your premiums more affordable. Use our free quotes tool to see how this works. 2. Choose a new life insurance company that we recommend as a potentially better match. We will work to get you the best possible coverage at a rate that matches your budget from our marketplace of leading insurance companies in the USA. Every life insurance company weighs their applicants’ risk factors differently when determining their life insurance policy quotes. Because your life can’t be represented by a single set of numbers, underwriters need to be able to get to know more of your story through a medical exam and learning about your personal history and lifestyle. At Quotacy, we’ve helped thousands of families get term life insurance at highly affordable rates. We specialize in helping applicants with unique challenges to becoming insured by finding the right policy for their family’s needs. The best part? You can start the process anonymously and without any obligation with our free life insurance quotes tool. Will my final life insurance price match my online quote? This is a great question. The answer is that it depends. There are hundreds of factors that go into determining the cost of a life insurance policy. If insurance companies worked all of these factors into quoting tools, no one would ever start the life insurance buying process because it would take far too long. Think of all the medical conditions and lifestyle habits there are. Imagine wanting a life insurance quote and having to check Yes or No to every single one before you see any pricing whatsoever. Much of America would be uninsured. Quotacy’s online quoting tool, just like everyone else’s online quoting tool, can only take into consideration very basic information when calculating your online quote. When you go to Quotacy.com you’ll be asked to enter your gender, zip code, age, and smoking status to provide you a basic quote. For an even more defined quote, continue on with your height and weight, nicotine products used, if any, whether or not you’re on blood pressure or cholesterol medication, and your immediate family’s health history. At this stage in the game you’ll receive a ballpark quote. For some clients, this will be same as their final price after going through the application process, but for some it won’t. Online quotes only factor in with certainty four things: your age, gender, build, and your nicotine use. Anything beyond that is difficult to quote online with accuracy and typically other agencies will stop their online quoting process at this point. But not at Quotacy. We have a set of human underwriters that take a second look at every application to make sure you’re matched with the right insurance company the first time around. 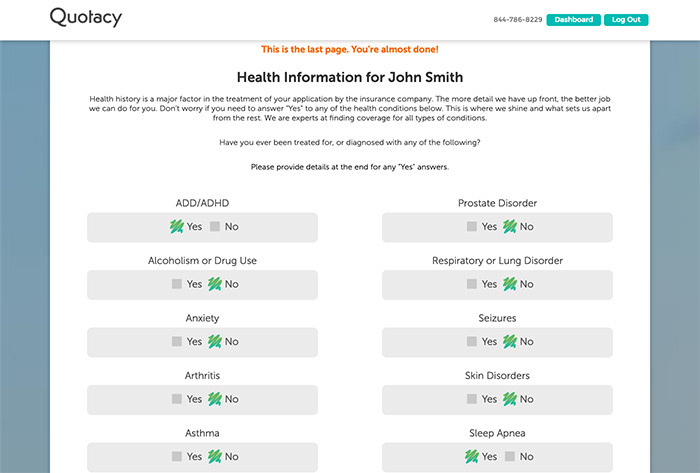 For example, on the final page of the online application you’ll be asked a set of Yes or No medical questions and if you answer Yes to any of these questions, your dedicated Quotacy agent may reach out for additional information to make sure we’re giving you the most accurate quote possible. By doing this, both you and your agent have set realistic expectations so you’re confident in moving on. 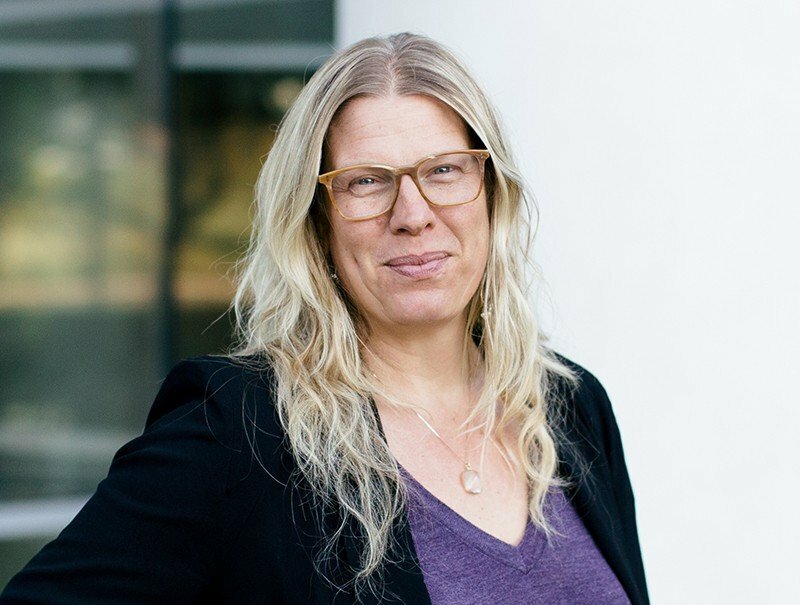 If our research team determines that, based on your Yes answers, a different price is more realistic than what you were shown online or if another insurance company than your original choice would be more favorable, your agent will simply recommend an alternate company and let you decide which way you’d like to proceed. Again, most online life insurance agencies don’t have the resources or take the time to do this level of research. We work for you not, the insurance companies. So whether you’re concerned about applying for life insurance because you think your recent marijuana use could have a negative impact on your price or if you think you’ll be declined because you have a criminal record, family history of cancer, or a medical condition yourself, like diabetes or sleep apnea, don’t worry about it. We’ve got a company for just about everything. To answer this week’s question will my final price be the same as my online quote? But no online insurance agency or company can guarantee that your online quote will be the same as your final price without looking at things like your medical records and physical exam results. So, remember, we’re on your side. The more information you can give us upfront when you’ve decided to buy life insurance through Quotacy, the easier we’ll be able to find you the best coverage option for your situation. So, if you’re looking for life insurance, look no further. At Quotacy you can get realistic term life insurance quotes without even giving away any contact information. If you have any questions about life insurance, make sure to leave us a comment. Otherwise, tune in next week when we talk about some popular fictional characters and figure out who needs life insurance more. Bye!